The Beddington Medal is the BSDB’s major commendation to promising young biologists, awarded for the best PhD thesis in Developmental Biology defended in the year previous to the award. Rosa Beddington was one of the greatest talents and inspirational leaders in the field of developmental biology. Rosa made an enormous contribution to the field in general and to the BSDB in particular, so it seemed entirely appropriate that the Society should establish a lasting memorial to her. The design of the medal, mice on a stylised DNA helix, is from artwork by Rosa herself. We would like to congratulate the 2019 winner of the Beddington Medal, David Munro, and would like to take this opportunity to give a brief overview of his career and the PhD project that was awarded the Beddington medal. 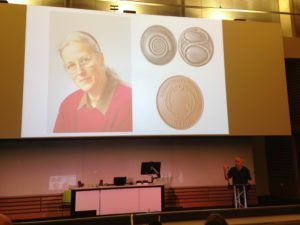 Jim Smith introduced the Beddington medal with heartfelt memories of Rosa Beddington and her time at the NIMR. Please read more of his thoughts here. 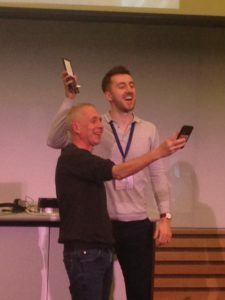 Some complicated selfies were taken as the medal was passed over before David went on to present the work that has deserved him this award. “The really impressive thing about David’s work is that he did not come to my lab to fit in with an existing line of research but created one of his own”. Jamie Davies, University of Edinburgh. David received his undergraduate degree in Sport and Exercise Science at the University of Stirling (2010-2014). With this, he achieved a first-class honours degree and the prize for the best overall performance throughout a physiology related degree (British Physiological Society Undergraduate Prize). His dissertation project investigated associations between ADRB2 mutations (an adrenaline receptor gene in humans) and athlete status/athletic ability measurements. Subsequently, he was awarded a University of Stirling Head of School Summer Bursary Award to remain in Stirling during the summer of 2014 and investigate the relationship between transcribed ultra-conserved regions of RNA (T-UCRs) and the development of diet-induced insulin resistance in humans (Summer 2014). He then moved to the University of Edinburgh for his MSc by Research in Biomedical Sciences (2014-2015). Again, he received a distinction and was awarded the Class Prize for best student. During this time, he studied the physiology of S-acylation the regulation of skeletal muscle energy expenditure by an obesity-associated phospholipase as part of two research placements. David has been awarded the Beddington medal for his exceptional work performed during his 3-year MRC-funded PhD at the University of Edinburgh with Prof Jamie Davies and Dr Peter Hohenstein (2015-2018): The thesis is titled ‘Mechanisms of kidney vascularisation and the roles of macrophages in renal organogenesis’. During his PhD, he gave several oral and poster presentations at national and international conferences, supervised students (including a Gurdon Summer Studentship Awardee), established numerous international collaborations, was awarded travel grants (including a BSDB Conference Grant), and reviewed manuscripts for leading journals (including Cell Reports, Angiogenesis, and Scientific Reports). He is now a post-doctoral fellow at the UK Dementia Research Institute (University of Edinburgh; 2019- present), continuing research in macrophage biology under the supervision of Prof Josef Priller. His current focus in on brain macrophages (microglia) in development, neurodegeneration, and aging. Kidneys are specialised organs that clean the blood, removing waste while retaining what is useful. This requires a complex vasculature, and its formation as a foetus develops is poorly understood. I started my PhD research by using advanced microscopy techniques to visualise how blood vessels form in three-dimensions in the mouse kidney. In doing so, I identified when and from where the first blood vessels enter the kidney, and how blood vessels pattern at the edge of the kidney throughout development. Blood vessels can form through angiogenesis (branching of new vessels from pre-existing ones) and/or vasculogenesis (assembly of new vessels from the coalescence of endothelial precursor cells). It has long been thought that a combination of both processes occurs during kidney vascularisation; however, my thesis work indicates that this concept may not be correct. My data instead suggest that kidney vascularization relies on growth and remodelling of pre-existing vessels (angiogenesis) and does not depend on vasculogenesis at any point (Publications 1 and 5 in CV). When assessing the entire 3D vascular tree of the kidney, isolated endothelial cells were never observed at any developmental age. Instead, all vessels, including the newly forming ones, were connected to pre-existing vessels that could be traced to the major circulatory vessels. I then focused on the blood vessels at the edge of the kidney, which I found to consistently and accurately pattern around a special collection of cells – the cap mesenchyme. The cap mesenchyme contains cells that eventually become the cleaning tubes of the kidney, the nephrons. This cell population undergoes rounds of splitting at the kidney’s periphery. As this happens, I demonstrated that blood vessels migrate through the newly opened regions between the separating cap mesenchymal populations (Publication 1 in CV). This occurs in cycles throughout development and is likely to be vital for the oxygenation of the kidney’s outer region, the site where important processes such as nephron formation take place. I determined that a signalling molecule, semaphorin-3f, and its receptor, neuropilin-2, were expressed in a pattern consistent with them having roles in this cyclical patterning of blood vessels; however, using mouse models where the genes for these molecules were deleted, I established that they were not vital for this process (Publication 2 in CV). I next shifted my research focus towards a specialised cell type known as the macrophage (macro = big; phage = eater) in the developing kidney (Publication 3 in CV). Macrophages are immune cells best known for clearing foreign and damaged cells. These cells have vital roles during animal development, but little is known about their specific functions during kidney development. Macrophages arrived in the mouse kidney early during its development, where they were required to clear away misplaced cells to ‘set-the-stage’ for early kidney development (Publication 6 in CV, under review). Throughout later development, most macrophages wrapped around blood vessels and I demonstrated their ability to eat endothelial cells (which usually line the blood vessels) and red blood cells (which are carried within them) within the kidney. I also established that kidney macrophages produced many molecules linked to blood vessel development, and so I examined the consequences of macrophage-loss on blood vessel formation. Blood vessels normally form continuous networks in the kidney; however, when macrophages were depleted (by blocking a macrophage-survival signalling pathway), connections between renal blood vessels were reduced (Publication 6 in CV). Munro DAD, Hohenstein P, Davies JA. 2017. Cycles of vascular plexus formation within the nephrogenic zone of the developing kidney. Scientific Reports. 7: 3273. Munro DAD, Hohenstein P, Coate TM, Davies JA. 2017. Refuting the hypothesis that semaphorin-3f/neuropilin-2 guide endothelial patterning around the cap mesenchyme in the developing kidney. Developmental Dynamics. 246:1047-1056. Mills CG, Lawrence ML, Munro DAD, El-Hendawi M, Mullins JJ, Davies JA. 2017. Asymmetric BMP4 signalling improves the realism of kidney organoids. Scientific Reports. 7:14824. Munro DAD, Davies JA. 2018. Vascularizing the kidney in the embryo and organoid: questioning assumptions about renal vasculogenesis. Journal of the American Society of Nephrology. (Perspectives article).